On the same Kinlde account, I have my Kindle Fire and several other devices (Kindle Keyboard, Kindle DX, iOS App, etc). All devices sync the last page fine, but sometimes the Fire does not. It’s the same for sending as well as receiving the furthest page read. It’s annoying, because syncing is one of the coolest features about Kindle devices. It wasn’t always like this and only started creeping in over the last year or so. Turns out that on Android-based Fire tablet devices, the Kindle reading app is just another app – and as such it’s prone to crashing on occasion. It probably doesn’t help that the first generation Kindle Fire hasn’t seen a firmware upgrade since its release, and there’s unlikely ever going to be another one. To fix our issue, all we have to do is to simply restart the Kindle app, and perhaps clear it’s (stale) cache while we’re at it. No time consuming reboot required! Now we have several options: Force Stop the app, clear its data, or clear its cache. I suggest you try “Force Stop” and “Clear Cache”, then head back to the home screen and select you latest book. This will restart the app and – hopefully – enable proper syncing again. In super severe cases, you can select all three options, but clearing the app’s data means you’ll lose all your downloaded Kindle books. You can of course download them again, but this step usually isn’t really necessary to bring back syncing. Just in case the other two options on their own don’t do the job, try “Clear Data” as a last resort. And that’s it! 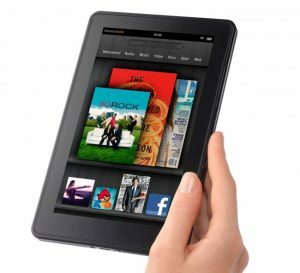 I hope this will make your Retrotech Kindle Fire work like a charm again, like it did for me.